"I've blended many reviewer suggestions for fried green tomatoes with an ingredient my elderly ex mother-in-law suggested. 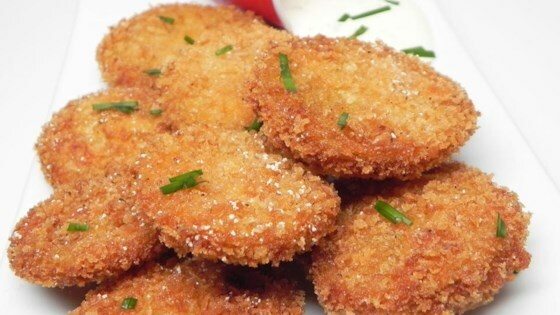 The result is a sweet, hot combination that delights fried green tomato lovers. Serve with ranch or blue cheese dressing as dip." Put hot sauce in small dish for dipping. Mix flour, brown sugar, grill seasoning, salt, and pepper in a separate small dish. Beat eggs into milk in a third dish. Pour panko in a fourth shallow dish. Arrange dishes in a line, respectively. Dip one side of each tomato slice in hot sauce. Press each side of tomato into flour mixture to coat; dip into milk mixture. Gently press tomato slices into panko to coat. Arrange coated tomatoes on a baking sheet. Refrigerate until chilled, about 30 minutes. Heat oil in a deep-fryer or a cast-iron skillet to 375 degrees F (190 degrees C). Fry tomato slices in hot oil until golden brown, 2 to 3 minutes per side. Perfectly crunchy, spicy and dippable!